It is sometimes assumed that every cut in a piece of Maori carving must have a meaning, but in fact probably much of it is purely decorative. The number of carvers of the nineteenth century who had been taught by pre-European experts makes it highly probable that most of the teachers' knowledge was passed on to the pupils. There is no convincing evidence that the knowledge was too sacred to be handed on, as much information about equally sacred matters was revealed even to Europeans in the early days of the European settlement. It is a reasonable conclusion, therefore, that either the amount of symbolism in carving has been greatly exaggerated or that it had been lost by the time the Europeans came to New Zealand. 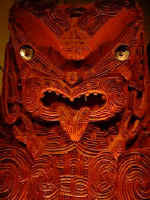 It is important to note that the figures in Maori carving, with very rare exceptions, are not religious, but secular. They do not represent idols, but rather renowned ancestors of the tribe. The nearest approach to idols were stone figures associated with agriculture and the so-called "god sticks" of which there are a few examples, mainly from the west coast of the North Island, in museums. These consist of a wooden peg about 18 inches long with a carved head on the upper end and the lower end pointed so that it can be stuck into the ground. Occasionally there are two heads, and sometimes the body or part of the body is shown. The tribal god was believed to enter the object when the shaft was bound with cord in a certain way and a fringe of red feathers was bound round the head as a beard. Without the binding the object had no religious significance. The practice of binding or wrapping deities was known in the Cook Islands and in Niue. The large carved meeting house (whare runanga) was usually named after an important ancestor and, in most parts of the country, was a symbol of that ancestor. The front of a carved house has at the apex of the gable a large carved head with no part of the body visible. This head is known as the koruru or parata. In old houses, it is actually carved on the projecting end of the ridgepole (tahuhu), and the body of the figure can be seen on the ridgepole inside the porch of the house. However, the house itself also represents the body of the koruru, who is the ancestor after whom the house is named. The arms of the koruru are the maihi or sloping bargeboards. At the lower ends of the maihi, which project beyond the upright figures (amo) on each side of the front of the house, is an open-work design with three, four, or five ribs running parallel to one another. Usually there is a manaia head between the ribs and the amo. 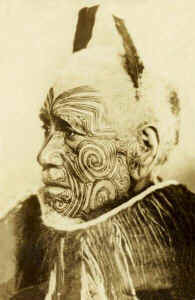 The ribs are fingers, and they and the manaia represent the hands of the ancestor. It is a very common convention to use a manaia head on the hand of a carved figure. The ridgepole of the house represents the ancestor's backbone, and the rafters (heke) represent his ribs. The inside of the house represents the stomach or bosom (poho). This explains the common practice in the Gisborne and Hawke's Bay area of naming a house "Te Poho o xxxxx", where xxxxx is an ancestor's name, as in "Te Poho o Kahungunu" and "Te Poho o Rukupo". A glance through the illustrations in W. J. Phillipps's "Carved Houses of the Western and Northern Areas of New Zealand" will show that the Waikato district is exceptional in that its early houses do not have the hands at the ends of the maihi. Instead, there are open-work spirals similar to those carved on the lower ends of the maihi on smaller storehouses. It appears, therefore, that the Waikato people did not observe the usual symbolic form of the house. Where the house represented the body of a famous ancestor, it would naturally be highly tapu. This would, of course, be most inconvenient to persons entering the house. One way of removing tapu from a man was to have a woman step over him as he lay on the ground. This was the practice when warriors returned from war in a tapu state, the principle being that a woman, having no tapu herself, could neutralise it in a man. The same principle was adopted to protect those entering or leaving a carved house. 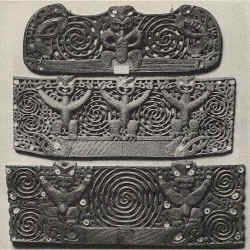 Over the door a carved slab (pare or korupe) was placed, bearing a design of three principal figures. The central figure, or all three, would be female. Thus a man passing beneath the pare would have the tapu of the house removed from him by the female figures or figure. Until recent times, the carved houses in most districts had no carving inside, apart from the pou toko manawa, the post supporting the ridgepole in the middle of the house. However, on the East Coast and in the Urewera and Arawa districts there were houses with carved figures on all of the poupou or wall slabs inside the building. This has been said to be a post-European practice which started on the East Coast and spread to Rotorua. 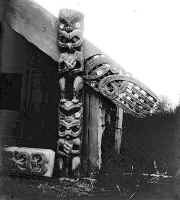 It is clear, however, that fully carved houses did exist in pre-European times, as such a building in an unfinished state was seen by Cook in Tolaga Bay on his first voyage. Each of the major figures on the poupou was named after an ancestor. Since about 1870 it has been the practice in the Arawa district, and later in other districts, to identify some of the ancestors by illustrating incidents in their lives. For instance, in the great "Tama te Kapua" house at Ohinemutu, Tama te Kapua and his brother, Whakaturia, are shown on stilts to illustrate the incident when they used stilts to rob the fruit off Uenuku's tree in Hawaiki. It is not clear whether this is an ancient practice. There seems to be no pre-European carving of this type remaining, but that is not to say it did not exist. In most cases there is nothing to identify the ancestor represented. Indeed, it is not uncommon for the figures to be named after the house is finished. In a monograph by Elsdon Best (N.Z. Journal of Science and Technology, Vol. V, p. 321), there are various illustrations of lizards in Maori carving. With two exceptions, all of the examples illustrated are Arawa work of the later nineteenth century. This does not mean, however, that the lizard is a post-European feature, especially in view of the continuous tradition of carving in the Arawa district. The carved house at the Spa Hotel, Taupo, was the work of Wero, one of the most outstanding carvers of Te Arawa in the middle of the nineteenth century and a pupil of other famous carvers. In this house a large lizard is superimposed on the body of the figure at the base of the pou toko manawa, or central pole supporting the ridgepole. Two of the illustrations in Best's paper show lizards on ridgepole supports. This may be significant in view of Best's statement that a lizard was sometimes buried beneath one of the three posts supporting the ridgepole of a school of learning or other important building, the lizard being generally viewed as an effective guardian. Two of the examples figured by Best show a lizard on the koruru head at the gable of a house. Hochstetter saw a lizard carved on the gable of a house when he visited Ohinemutu in 1859. The lizard is also found in North Auckland carvings. A particularly fine example given by Best is on the lid of a burial chest. Another lizard appears on the supporting post of a small carved storehouse painted by Earle in North Auckland in 1827 and given in Phillipps (Maori Houses and Food Stores, 1952, p. 181). This storehouse is the kind used to hold the bones of important people. There is probably an element of protection in both of these northern examples. The same may be said for a large lizard carved on a tomb illustrated by Taylor (Te Ika a Maui, 1855, p. 106). There is a lizard carved on the outer threshold of the storehouse "Hinana" built by Iwikau (Te Heuheu Tukino III) of Ngati Tuwharetoa between 1854 and 1856. This again may have been a warning of the tapu nature of the building. The elaborate pataka built by Te Pokiha of Te Arawa in 1868 and now in the Auckland Museum has a series of lizards carved on the ridgepole. In the Dominion Museum there is a canoe thwart on which there are two lizards. It is said to have been the thwart on which the Tohunga sat. Best's paper also has an illustration of a lizard carved on a bone flute in the British Museum. The lizard was sometimes carved in the form of an amulet. A good example is given by Skinner (JPS, Vol. 43, p. 196). A beautiful example of Maori rock painting depicting two reptilian figures faces the same page. It is worth repeating that the human figure was the basic design of the Maori carver, and when he was decorating objects, such as feather boxes, he used this basic design and probably had no thought of symbolism. It is interesting to observe that on these lesser objects the human figures are very frequently female. This is possibly because of the lack of tapu associated with women. In addition to their many forms used in surface decorations, spirals are an important element in relief carving. Maori spirals are almost always double, though single spirals are occasionally seen carved on stone objects. As the elements in relief carving consist almost entirely of human figures, apart from the spiral, Archey has put forward a theory that the spiral itself has evolved from interlocking manaia, or the interlocking mouths of manaia. It is true that there are numerous examples of openwork spirals which do consist of two interlocked manaia or interlocked manaia mouths, but whether the spiral gave rise to these forms or evolved from them is not known. 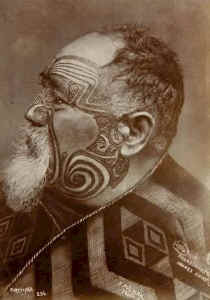 The spiral was commonly a prominent feature of maori male face tattoo. The openwork spiral is known as pitau or takarangi. Such spirals do not stand alone, but are placed between human figures or between the heads of human figures. The finest spiral designs are those on the bow and stern ornaments of war canoes and on door lintels. Spirals are also used between full-faced figures or manaia on door posts, window frames, and on the lower edges of maihi or bargeboards on the front of carved houses. On war canoes and in some house carvings spaces between the two volutes of a spiral are cut right through the timber producing, in superior work, a lacelike effect. Almost every one starts in the centre with a pointed elliptical space, or with a letter S.
Maori wood carving was often high-lighted with red ochre. The mythological of the origin of this important colour is as follows. There was much blood shed during the separation of Papa-tu-a-nuku (Earth) and Rangi-nui (Heaven), the primaeval parents. The blood of Rangi-nui is sometimes seen as a red glow in the sky. The Maori call it papakura and they look to it for signs and omens. The blood of Papa-tu-a-nuku, the Mother Earth, flowed into the earth itself and became red clay. This is the origin of kokowai, the sacred red of the maori. It is utilised in a number of traditional ceremonies. When applied in conjunction with a karakia it becomes tapu. The kokowai was burned in a fire, ground into a fine powder and mixed with shark oil to make paint. This paint was then used as a stain for wood carvings and for the painted patterns on the rafters of the meeting houses known as kowhaiwhai. Membership in the Hakluyt Society is highly recommended to everyone interested in the history of exploration and travel. Two scholarly volumes distributed to members each year. Maori Info © ammonet InfoTech 2001 - 2015. All rights reserved.